It finally happened on Friday. Our 15+ year old Maytag dryer just stopped heating. Oh, it'll work without heat, it just takes five times as long to dry anything. Heat is good. So again, we're at the crossroads of fix or replace? Any appliance that is this old is approaching it's end of life and we know this. (Although we had a dryer that was from the 60's that we gave to my brother in law and the thing just died 5 years ago. They truly don't make 'em like that anymore.) Having replaced the belt on the dryer a couple of years ago, I thought I'd look up how to replace a heating element on it. It didn't look too daunting, so I thought I'd give it a whirl. All of the videos showed people just taking off the back of the dryer to get to the element. Half a dozen screws, new heat element, Zip, Zip, Zip, Done! Well, we have the dryer equivalent to a uni body. The three sides and bottom are all one. 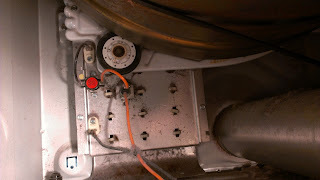 Luckily, after I popped the bottom panel off, I saw that, with a little work, I would be able to reach the heating element without having to take off the front door, drum and belt. This made me think it might not be bad. Zip, Zip, Zip, Done! I then called our handy appliance parts supplier Johnstone Supply in Waukesha to see if they had the parts. They informed me that they do "wholesale only" now to businesses with an account. They said I could call the Milwaukee store and see if they had the parts because they sell to helpless folk like me. So I called and it turns out they did have the parts. The problem is that store is about 30 minutes away. So much for Zip, Zip, Zip, Done! I zip up to Appleton Ave. and Silver Spring to get the part. Of course the clerk couldn't locate the part. He said the guy who had taken my call had just left and hadn't done a "physical" (i.e. verified the part actually existed within the confines of their store.) and that they had no part. The good news was, guess what? The Waukesha shop did! And he would make an exception and sell me the part from there. Hooray for the Waukesha branch and high gas prices! Yay! So I zip over to the Waukesha store and pick up the $50.00 (gas not included) heating element. With the help of my father in law and my ability to dislocate my shoulder to reach the screws, I manage to install it in 15 minutes (Zip). I plug it in. (Zip). I turn it on. (Zip) and after 2 minutes I open the door to see if it's hot. Feel with hand: Room temperature (Not done). Before I leave, I thought I'd check one connection, so I grabbed the wire lead and after it touched the side of the dryer, ZAP POP! Sparks flew and my heart arrhythmia was instantly corrected. Hey DA. Don't forget to unplug the dryer. Oops. I zip over to the Waukesha location and luckily, the guy remembered me and was gracious enough to sell me the parts. (Another $40). I Zip back home and in twenty minutes I have the new parts installed. (Zip). I plug it back in (Zip), and turn it on (Zip) and miraculously we have heat! We did it! The moral of the story is, I learned a little bit about electricity today. And perseverance. And dryer repair.